Wet sump = The bottom of the engine is used as a built-in reservoir for oil. 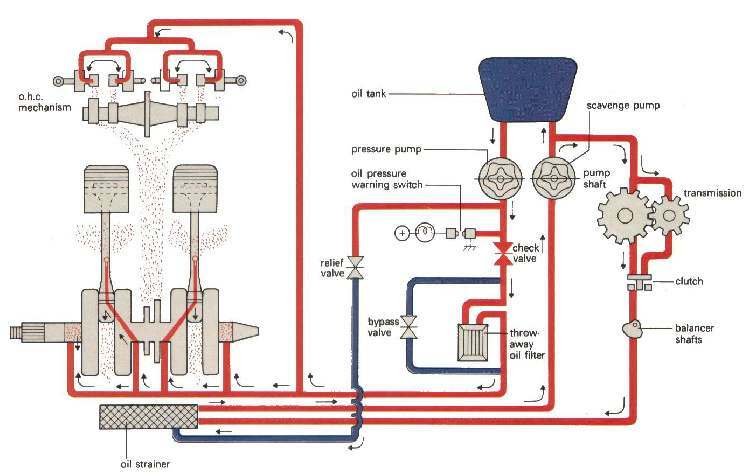 In a dry sump, the oil still falls to the base of the engine, but rather than being allowed to collect in a reservoir style oil sump it falls into a much shallower sump where it is removed by one or more externally mounted scavenge pumps and is pumped into an external reservoir where it is both cooled and deaerated. In most production automobiles, which use a wet sump system, this oil is simply collected in a 3 to 10 litres (0.66 to 2.20 imp gal; 0.79 to 2.64 US gal) capacity pan at the base of the engine, known as the oil sump (or oil pan in American English), where it is circulated back through the engine by an oil pump drawing, or "scavenging" from the sump's reservoir. This pump is mounted internally to the engine and is typically driven by the camshaft. The most obvious advantage is that increased oil capacity afforded by the remote reservoir and the capability to mount the engine lower in the vehicle because of the thinner profile of the sump — and thereby lowering the overall center of gravity. The external reservoir can also be relocated to another part of the car to improve weight distribution. Increased oil capacity by using a larger external reservoir than would be practical in a wet-sump system allows the oil to cool and release entrained gasses from ring blow-by and the action of the crankshaft. Furthermore, dry-sump designs are not susceptible to the oil movement problems that wet sump systems can suffer due to high cornering forces. If the oil in a wet sump is forced to one side in the oil pan the oil pump pickup tube can be temporarily uncovered leading to a loss of oil pressure. Because the scavenge pumps are typically mounted at the lowest point on the engine, the oil flows into the pump intake by gravity rather than having to be lifted up into the intake of the pump like a wet sump does. Also, the scavenge pumps can be of a different design that is more tolerant of entrained gasses than the typical pressure pump which can lose suction if too much air is mixed into the oil. 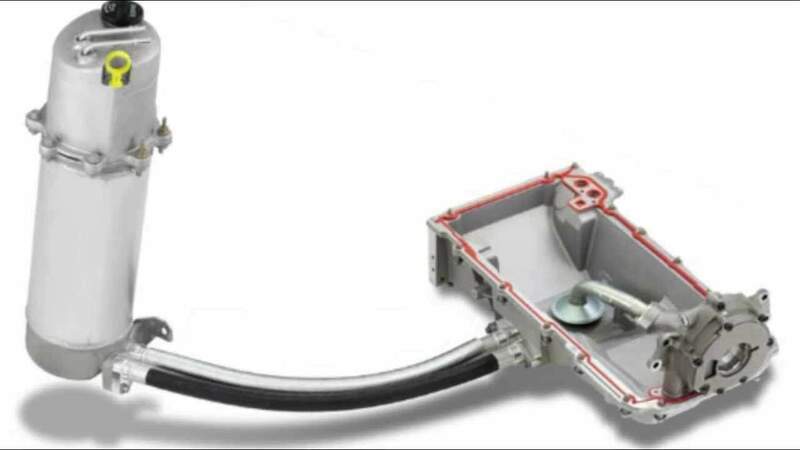 Since the pressure pump is typically lower than the external oil tank, it always has a positive pressure on its suction regardless of cornering forces. Another phenomenon that occurs in high-performance car engines is oil frothing up inside the crank-case due to the very high revs agitating the oil. Lastly, having the pumps external to the engine allows them to be maintained or replaced more easily. Dry sump systems add cost and complexity, however. The extra pumps and lines require additional oil, causing maintenance costs to rise accordingly. Also, the performance-enhancing features of dry sump lubrication can hurt a bike's day-to-day drivability in that the oil may not get up to the correct operating temperature as it would have in racing conditions. 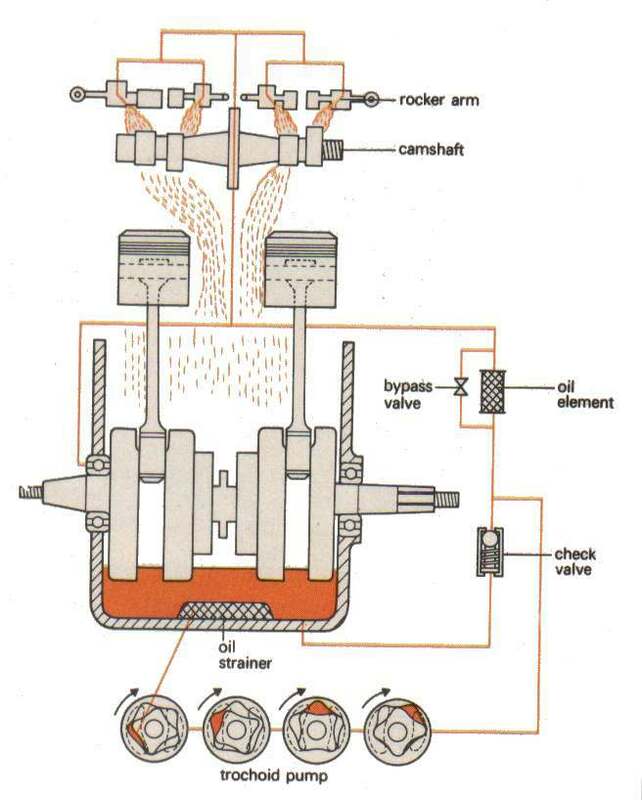 "Diagram of a dry sump"
Racing motorcycles usually benefit from dry sump lubrication, as this allows the engine to be mounted lower in the frame; and a remote oil tank can permit better lubricant cooling. Some bikes though use a semi-dry sump system, including many off-road machines as well as the BMW and Kawasaki. What this really means is that the system is to all intents and purposes a dry sump design, with two oil pumps, but the oil tank is still incorporated inside the engine cases. In the F800’s case it’s still stored beneath the engine, but not directly beneath the crankshaft, and in a similar way the ER-6’s oil is stored beneath the gearbox. It’s a little more complex but by doing it this way the designers have more scope for lowering the engine and making it more compact. Small two-stroke engines, as for motorcycles, use crankcase compression: the mixture passes through the sump space in the crankcase. This precludes the use of both wet sump and dry sump systems, as excess oil here would contaminate the mixture, leading to excess oil being burned in the engine and so extremely high HC emissions. These engines are instead lubricated by petroil mixtures, where a carefully measured proportion of oil is added to the fuel tank (between 1:16 and 1:50 ratios). This oil is consumed immediately and entirely, so there is no need for a sump to collect and re-use it. "A two-stroke engine - simpler, less moving parts, lubrication mixed into fuel"